Leeds based political and topical comedian. 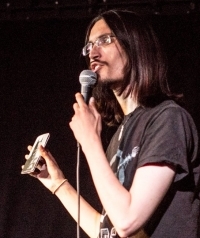 I'm the founder of No Fixed Abode, an established student comedy group, and I have performed stand up at over 600 gigs, including the Wolfson College Howler, the Footlights Smoker, Chortle Student Comedy, Cambridge University May Balls, and has performed at the Edinburgh Fringe for several years running, with a 5* show in my first year. I have performed in Cambridge, London, Leeds, Manchester, Cardiff, Edinburgh, and Norwich.